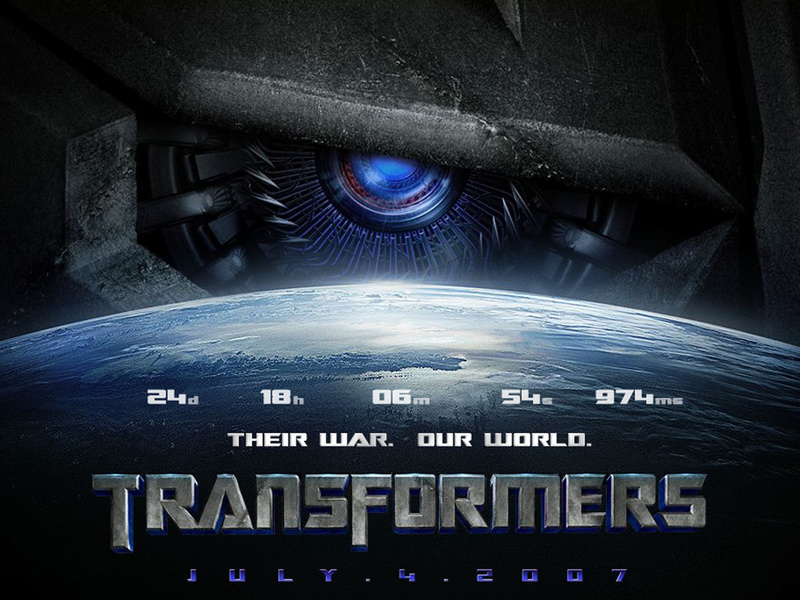 U.S. Military Feels the Transformers Movie is "going to have a positive impact on recruitment," says producer Ian Bryce. In the Democratic presidential debates of April 26, 2007, former Alaska Senator Mike Gravel said, "The military industrial complex not only controls our government lock stock and barrel, but they control our culture." Indeed, my visit to the set of the upcoming Transformers movie was a transparent affirmation of this statement. The Transformers opens this summer and is being based on the wildly successful toy line and animated series of the same name which featured morphing robots battling each other. August 26, 2006 (Los Angeles): The presence of the military at the location could not be missed: before my shuttle bus even pulled up to the site at 9th and Broadway Streets, I could see several actual U.S. troops in desert camouflage fatigues walking in an ally parallel to Broadway. (For a split second, I wondered if L.A. was under martial law.) The block of Broadway between 9th and 8th had been transformed into a battle zone populated by U.S. troops, many attending armed vehicles. This was a stark contrast to the many peace marches I had attended on this same spot. (Pictures of the filming here: http://eecue.com/images_archive/eecue-images-27212-transformers_movie_set.html.) Director Michael Bay, who worked with the military on previous films, even wore an Air Force baseball cap as he scrambled about the busy set. When asked about conditions for the military's co-operation, Bryce replied: "Michael [Bay] and I both have relationships with the military from previous movies. The first step is to go to them and just alert them that there's a project that really requires military co-operation and assistance. So we made some phone calls a year or so ago and just let them know we were out here, and there was a script." Once the Department of Defense read the script, "They were excited," he continued. "They had a few comments to make on the script, just about this and that, but generally, they were extremely enthusiastic and supportive to the project. For them it's all about showcasing the military in an appropriate and positive light, and is it going to have a positive impact on recruitment, which they feel that this one does." Bryce went on to say that graphic violence was being avoided in this movie (i.e., violence will be depicted sans consequences. Star Trek creator Gene Roddenberry called this "dishonest violence"). "You've got to bear in mind that your audience is going to involve some younger kids. We're very careful about making sure you don't cross over a line. In terms of our human action, we're very careful about [showing] no blood. If there's a car [demolition] you want to see somebody get out and survive. There will be mayhem, but you want to be careful about the portrayal of it." When Arlene Inouye of the Los Angeles-based Coalition Against Militarism in our Schools (CAMS, website: http://www.militaryfreeschools.org/) learned of my experience, she commented: "How long will we accept this glorification of war and guns as child's play? Haven't we had enough children killed through violence, gangs and the military? Let's question the values and let's question the mission. There is something wrong with a society that lures it's own children to kill other people's children in a foreign land." ". . . For them it's all about showcasing the military in an appropriate and positive light, and is it going to have a positive impact on recruitment, which they feel that this one does."